Steve Dalton, "Financial Applications using Excel Add-in Development in C / C++"
- Extensive example codes in VBA, C and C++, explaining all the ways in which a developer can achieve their objectives. - Example projects that demonstrate, from start to finish, the potential of Excel when powerful add-ins can be easily developed. 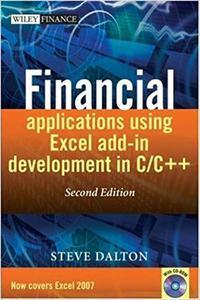 - Develops the readers understanding of the relative strengths and weaknesses of developing add-ins for Excel in VBA versus C/C++. - A CD-ROM with several thousand lines of example code, numerous workbooks, and a number of complete example projects.